In a class action lodged with the U.S. District Court for the Northern District of California, the City of Roseville Employees' Retirement System, filing on behalf of all Apple stockholders, seeks redress for violation of federal securities laws. Listed among the defendants are CEO Tim Cook and CFO Luca Maestri, who are alleged to have made false and misleading statements regarding iPhone sales, performance in the Chinese market and earnings forecasts. Those statements caused Apple's stock price to artificially inflate in the last calendar quarter of 2018, leading to material losses when share prices fell after the company released a guidance revision in January. The period in question begins on Nov. 2, 2018, a day after Apple reported earnings for its fourth fiscal quarter. During an ensuing conference call, Cook and Maestri recapped the report and reiterated record-breaking guidance for the important holiday quarter, which at the time was pegged to fall between $89 billion to $93 billion. "It's the strongest lineup that we've ever had," Maestri said at the time, as noted in the complaint. "And our guidance range, by the way, represents a new all-time quarterly revenue record." Apple ultimately generated $84.3 billion in revenue for the first quarter of 2019, a miss blamed in large part on a 15% downtick in iPhone sales. Plaintiffs allege Apple and its executives "lacked a reasonable basis in fact" when issuing revenue guidance for the coming fiscal quarter and making statements on the health of its business. Statements from the defendants regarding a range of financial topics were either false or misleading because they knew and failed to disclose key facts that would negatively impact the company's stock price, the plaintiffs claim. Starting with Apple's bread-and-butter iPhone, the document notes Cook said the two most recently released models, iPhone XR and XS, "got off to a really great start." Cook and company also misrepresented or failed to mention a slowdown in iPhone replacements, a phenomenon catalyzed by a battery replacement program instituted in late 2017. It was later learned that Apple replaced 11 million iPhone batteries under the program, some 9 million more than what the company expected. Executives also failed to reveal cuts in iPhone production orders as a result of a slowdown in demand, according to the complaint. China, a major growth market for Apple, is also a bone of contention. Fielding a question from analysts during the fourth quarter call, Cook maintained Chinese demand was strong. The suit, however, claims Apple was being undercut by local manufacturers offering devices that were both more innovative and less expensive than the increasingly pricey iPhone. Further, Apple downplayed U.S.-China tensions resulting from a brewing trade war. Asked about U.S. tariffs and their potential effect on iPhone demand, Cook said Apple was seeing pressure only in emerging markets with weakening currencies. "In relation to China specifically, I would not put China in that category. Our business in China was very strong last quarter," Cook said, according to the suit. "We grew 16%, which we're very happy with. iPhone, in particular, was very strong double-digit growth there." Finally, plaintiffs argue Apple attempted to mask slowing iPhone sales by ending reportage of unit sales. For its part, Apple maintains that the number of units sold does not necessarily represent the relative health of a product's underlying business, a reasoning based on rising average selling prices. 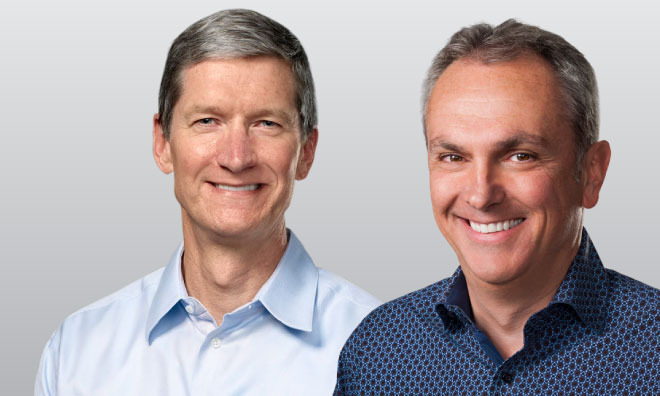 Whether commentary from Cook and Maestri, as well as the report from Apple, are admissible in court is unclear, as the presentation was proffered under a disclaimer of forward looking statements. Apple in its earnings report includes the mandatory Securities and Exchange Commission disclaimer, something also noted by the call's operator prior to introducing the executives. Maestri himself prefaced his comments with a caution that they include forward looking statements. Plaintiffs seek determination of a proper class action, unspecified damages and court fees.